Some property managers may feel a paid bookkeeper gives them what they need regarding record keeping of rental units. Others don’t mind using the more expensive option of industry specific software. However, for people who like DIY types of rental property record keeping solutions, QuickBooks for Landlords offers what most users consider the best option for each aspect of rental unit management. This example clearly show the tenant’s running balance after each transaction. Notice that in addition to the monthly invoices for rent earned on each property and monthly payments applied, you can see specific charges for things that the tenant is responsible for. With QuickBooks for Landlords, these things can be added EITHER to the rent balance or the balance of the deposit and can be tracked separately. 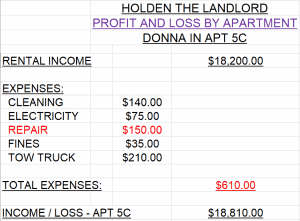 The report above reconciles with the report below and shows profit and loss by apartment. The secrets to making these reports as well as total record keeping accuracy are taught in this best-selling online video course: “QuickBooks for Landlords”. This simple, step-by-step, follow along QuickBooks online video course gives students the ability to generate these bookkeeping reports in the blink of an eye. Most students of the online program say they love the course because it starts off so simple and slowly moves to more advanced topics at a comfortable pace. Users of the online video program report that it makes using QuickBooks for property rental bookkeeping as easy as an elementary school computer class while at the same time, giving landlords everything they need to manage the financial aspects of their rental properties. Clearest possible examples of every possible transaction that any landlord or property manager could need for their rental properties. Clearest possible explanation for every step of the QuickBooks bookkeeping set up. Unlimited email questions answered for topics in the QuickBooks for Landlords online video course material. 10- Day money back guarantee if not completely satisfied. 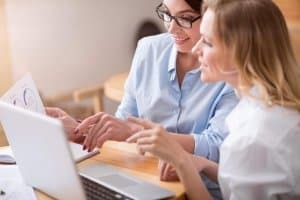 Don’t be fooled by a program just because it was designed specifically for rental properties; QuickBooks is still the better bookkeeping choice for managing your real estate financial records. QuickBooks desktop pro can easily handle thousands of tenants records as well as tens of thousands of transactions in 1 file. The naysayers will never discuss how much cheaper it is or how much easier QuickBooks is to use than the software they are trying to sell you. But one thing everyone admits, QuickBooks is the absolute easiest option to get help and support for all your rental property bookkeeping needs. If you are looking to get someone else to do your books, they are more likely to already know some aspects of QuickBooks than any other software. So for an investment of just a few short hours of study time, as well as the amount spent going out to dinner, you can become an expert in one of the most common and popular in-demand bookkeeping software solutions and have a program that gives you what you need. Your life will be simpler and your properties will be more profitable. This new, perfect, easy-to-use, guaranteed financial solution is available at www.quickbooksforlandlords.net. Mark Smolen has been a Certified QuickBooks Pro Advisor Since 2011. 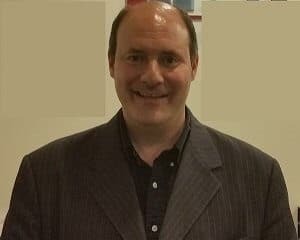 In 2015 he created this YouTube Channel www.youtube.com/worldwidequickbooks that has reached thousands of landlords who want to learn about QuickBooks. Smolen’s extensive experience began when he taught Computerized Accounting at A.S.A. College from 1993 to 2008.